Microsoft Office – Installer compatibility ‘Click-to-Run’ and ‘Windows Installer’ ← Readycrest Ltd. 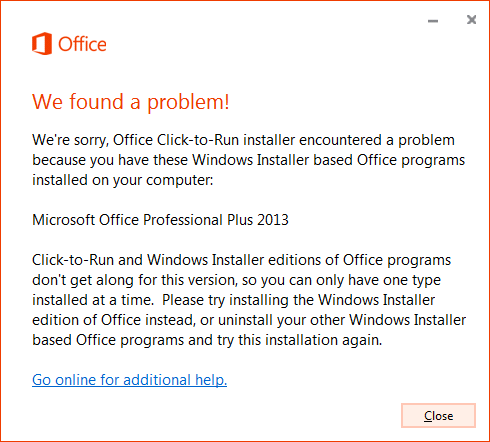 Unfortunately, you can’t have Office products of the same version (like 2013 or 2016) that use two different installation technologies installed on the same computer. This also applies to standalone applications like Access, Visio, Project, Skype for Business, or OneDrive for Business. In some cases, you also can’t have two different versions of Click-to-Run applications on the same computer. For more information, see “Stop, you should wait to install Office 2016” error.